I’m working on a research project––totally legitimate, connected to a big macher in academia––that is requiring me to watch a lot of Anwar al-Alwaki videos and read Tumblrs of teenagers who’ve fled to join ISIS. I am not, repeat NOT, of this persuasion, like at all. Just wanted to let you know. PS Would a wannabe jihadist really be using a yiddishism? Doubtful! According to my most favorite website ever, Williams is buried in section 15A of the Calvary Cemetery and Mausoleum in Saint Louis. I propose we go over there, dig up his body, drive it down to the Gulf and fulfill his last wish. Who’s with me? I’m particularly looking for people with strong arms, poor senses of smell, and grave robbing experience. MB: random question… do you think its odd to bring my therapist cookies? 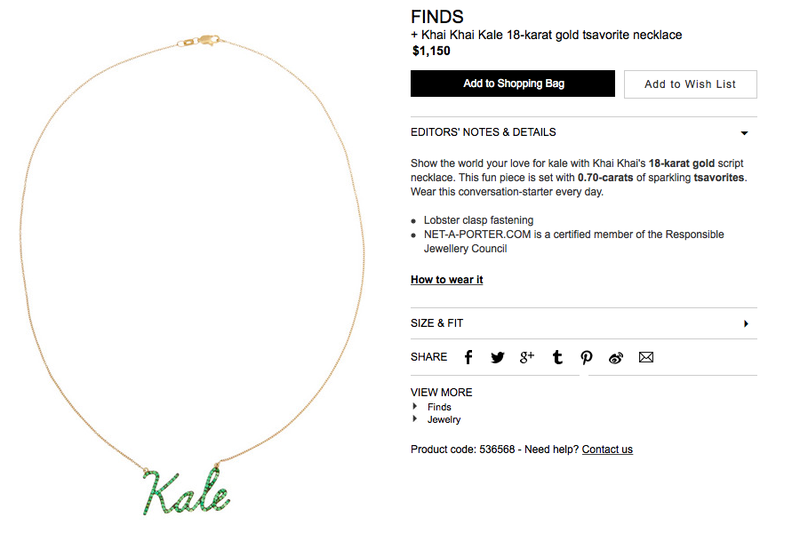 A little soon for another blog post but: a $1K diamond KALE necklace. “I value money literally for its own sake. I like the feeling of dollars and quarters rubbing softly together in my hand. Always it reminds me of those lovely chestfuls of gold that Captain Kidd buried––no one seems to know just where. Usually I keep some fairly-clean dollars and quarters to handle. ‘Money is so nice!’ I say to myself. You are currently browsing the Itinerantdaughter's Blog blog archives for December, 2014.